Dagenais, Maxime. "Ludger Duvernay". The Canadian Encyclopedia, 24 June 2015, Historica Canada. https://www.thecanadianencyclopedia.ca/en/article/ludger-duvernay. Accessed 19 April 2019. Ludger Duvernay, newspaperman, editor, printer, politician, Patriote (born 22 January 1799 in Verchères, Lower Canada; died 28 November 1852 in Montréal, Canada East). Ludger Duvernay, newspaperman, editor, printer, politician, Patriote (born 22 January 1799 in Verchères, Lower Canada; died 28 November 1852 in Montréal, Canada East). 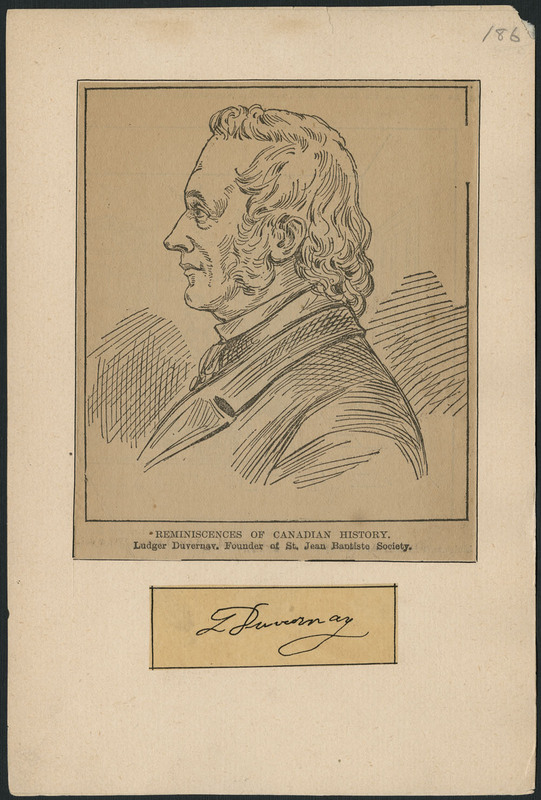 A man with a fiery personality, Duvernay was one of Lower Canada’s most important newspaper editors and revolutionaries. In 1827, he purchased La Minerve and turned it into one of the colony’s most powerful newspapers and the mouthpiece of the Patriote cause. He was also a founder of the Société Saint-Jean-Baptiste (then called the Association Saint-Jean-Baptiste de Montréal). Following the Patriote defeat in 1837, he left for the United States and settled in Burlington, Vermont, where he continued to defend French Canadian interests. He returned to Montréal and La Minerve in 1842. Born on 22 January 1799, Ludger Duvernay enjoyed a modest but comfortable childhood in Verchères. While his father, Joseph, was a master carpenter, his mother, Marie-Anne-Julie, was a member of the noble Rocbert de la Morandière family, which had a distinguished past in Canada. Her great-grandfather, Étienne Rocbertde la Morandière, was the king’s storekeeper and subdelegate of the intendant at Montréal. Duvernay also benefited from an excellent education under the tutelage of Louis-Généreux Labadie, one of the colony’s premier educators. His interest in printing and newspapers was obvious at a young age, an interest that would make him one of the colony’s most influential figures. At the age of 14, he began an apprenticeship at Charles-Bernard Pasteur’s Montréal-based newspaper Le Spectateur. A year later, Pasteur hired young Duvernay to work at his Montréal printing house, even giving him managerial responsibilities when Pasteur was absent. In 1817, at the age of 18, Duvernay left Montréal for Trois-Rivières, where he started his own printing house and newspaper, La Gazette des Trois-Rivières. In the 10 years he spent there, he also established L’Ami de la religion et du roi, Le Constitutionnel and L’Argus, giving him the title of “le père du journalisme trifluvien.” He left for Montréal in December 1826. In 1827, Ludger Duvernay purchased La Minerve and began the career that would make him famous. Duvernay turned La Minerve from a small, struggling newspaper (which could only muster 240 subscribers under the leadership of Augustin-Norbert Morin) to one of the colony’s most important papers. Though the newspaper had a modest circulation of 1,300 by 1832, its actual readership was much greater because its more politically charged articles were often recited to groups of illiterate people during public gatherings. Under Duvernay, La Minerve was more than a newspaper; it was the mouthpiece of the Parti Patriote. He promoted the party’sagenda on a national level, making him one of the most influential Patriotes in the process. Duvernay was involved in many other activities during this period, including politics. He ran (and lost) in an 1833 by-election; he was then dissuaded from running in the 1834 general election by Patriotes who argued that his immense talent could be better used with La Minerve. He was finally elected to the Legislative Assembly in May 1837 as the representative for Lachenaie. Duvernay was also co-founder of a group known as “Aide-toi, le Ciel t’aidera” — an earlier version of what would become the Association Saint-Jean-Baptiste in 1843 — and he established June 24 as the French Canadian national holiday, Saint-Jean-Baptiste Day. Duvernay helped organize the first celebration in 1834. Duvernay was known for his fiery character and temperament. Though he was very popular, he also was extremely stubborn, especially when politics were involved. He made several enemies during his time at La Minerve as some of its articles crossed the line into personal attacks. He was arrested and jailed on numerous occasions for libel and was involved in at least one duel, which took place on 5 April 1836. Duvernay was challenged to the duel by Clément-Charles Sabrevois de Bleury, co-founder of Le Populaire and deputy for Richelieu, after La Minerve printed a series of articles insulting him and his move to the more moderate wing of the Legislative Assembly. Duvernay suffered a wound to the right leg in the process. Duvernay’s temper later landed him four days in prison after he physically assaulted Joseph-Guillaume Barthe in 1845, infuriated that Barthe’s newspaper, L’Aurore des Canadas, was awarded the right to advertise official notices. In 1837, Ludger Duvernay left Canada and found refuge across the border, first in Swanton and Saint Albans, Vermont, and Rouses Point, New York, before finally settling in Burlington, Vermont. He had little choice. On 16 November, the Longueuil skirmish had marked the first military engagement of the 1837 Lower Canada Rebellion, and Lord Gosford had issued a warrant of arrest against 26 Patriote leaders, including Duvernay. He risked imprisonment if he remained in the colony. 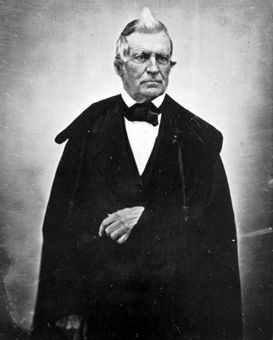 While in exile, Duvernay continued to defend French Canadian interests and to promote the Patriote cause. In 1839, he founded Le Patriote Canadien, one of the first French-language newspaper in the United States. Though the newspaper was aimed at the exiled Patriote population of the United States, Americans were also invited to read it; at least one article in each edition of the newspaper (which was almost exclusively written by Duvernay himself) was in English. The newspaper not only kept the exiled Patriotesinformed about current events in Canada but also educated local Americans about the Patriote cause. Though exiled and banned from circulating his Patriote Canadien in Lower Canada, Duvernay nonetheless continued to spread political dissent in the colony. For example, shortly before the union of the Canadas, he sent a series of letters to Jacques-Alexis Plinguet’s La Canadienne calling for a national movement of resistance against the union. Between August and October 1840, La Canadienne printed a series of letters from a man calling himself “D . . . B-V,” very likely Duvernay, from Burlington, Vermont. Plinguet, the editor of the newspaper, admitted that he had maintained contacts with the exiled Patriote and that same October also printed an article on the history of newspapers in Lower Canada openly written by Duvernay. In the letters, Duvernay pushed for a general boycott of the union.Initially, he argued that French Canadians should boycott the election and not vote, as he did not want French Canadians to participate in any way. Soon after, he suggested that the population should no longer boycott the election, but instead elect Patriote candidates to the united Legislative Assembly.Once elected, all Patriote representatives should get up and leave the Assembly in defiance. He hoped this would send a clear message to Great Britain and have the desired impact: the annulment of union. 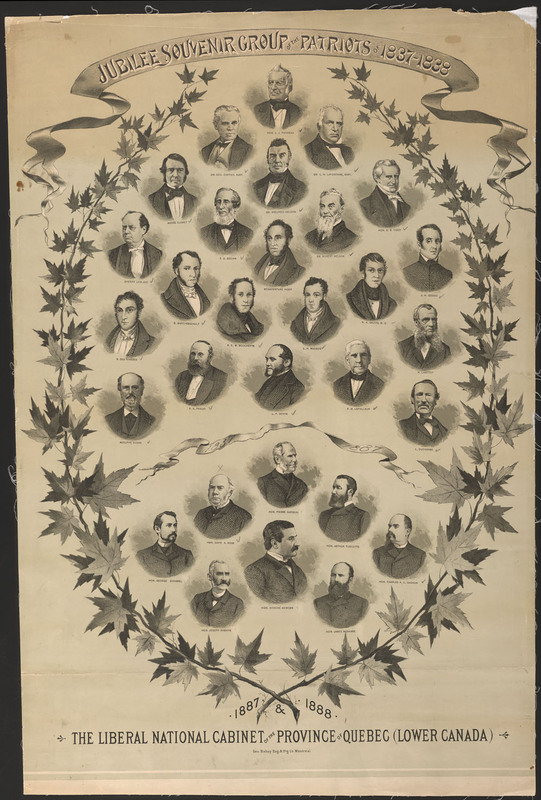 Much changed in Lower Canada following the union of 1841: Lower and Upper Canada were united (see Province of Canada), the Parti Patriotewas replaced by the Parti Réformiste, and Louis-Hippolyte LaFontaine replaced Louis-Joseph Papineau as the colony’s political leader. In 1842, the reformists asked Ludger Duvernay to return to the helm of La Minerve and use it to support LaFontaine’s conciliatory policies. He agreed. During his second tenure, La Minerve transformed from a radical to a moderate newspaper that championed LaFontaine’s goal of making the best out of union and his quest for responsible government. Duvernay even opposed Papineau’s return to politics in 1848, calling the former Patrioteleader an “agitator” when he openly opposed LaFontaine’s policies, a betrayal that Papineau never forgave. Though Duvernay never fully supported the union, he, unlike Papineau, realized that it was at that moment the only practical option. On 28 November 1852, about one year after becoming president of the Association Saint-Jean-Baptiste de Montréal, Duvernay died. He was an important figure in Canadian history, and his funeral was attended by several leaders, including LaFontaine. Following his death, as the newspaper changed ownership, La Minerve underwent another major transformation, this time from a moderate, reformist newspaper to a champion of George-Étienne Cartier and John A. Macdonald’s Conservative Party. In 1944, the Prix Ludger-Duvernay was created in his honour. This prize celebrates the work of a Québécois author. George Aubin and Jonathan Lemire, Ludger Duvernay: Lettres d’exil, 1837-1842 (VLB Éditeur, 2015). Maxime Dagenais, “Defending French-Canada: Le Fantasque, Censorship and the Special Council of Lower Canada, 1838-1841,” Canadian Journal of Media Studies vol. 12, no. 1 (June 2013). Yvan Lamonde, Histoire sociale des idées au Québec, 3 vol. (Fides, 2000). Jean-Marie Lebel, “Duvernay, Ludger,” in Dictionary of Canadian Biography, vol. 8 (2003). Birdie MacLennan and Fanny Mion-Mouton, “Our first French language title, Le Patriote Canadien,” Vermont Digital Newspaper Project. Denis Monière, Ludger Duvernay et la révolution intellectuelle au Bas-Canada (Éditions Québec/Amérique, 1987). LUDGER DUVERNAY BIOGRAPHYA biography of Ludger Duvernay (in French). From the official website of the Assemblée nationale du Québec.